Catholic News World : Pope Francis "..every human life is unique, and that if the disease is rare or very rare, it is still life that is so." Pope Francis "..every human life is unique, and that if the disease is rare or very rare, it is still life that is so." 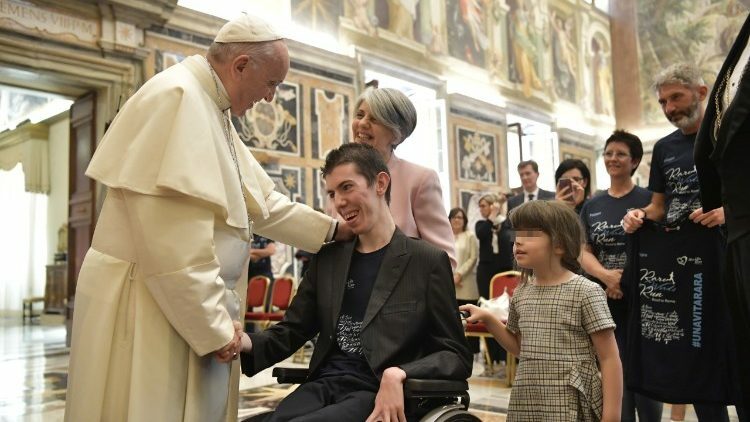 Pope Francis met with Giorgio and Rosita, founders of “Una Vita Rara”. Giorgio and Rosita founded this organization in 2016 after receiving a diagnosis regarding their son Davide in 2015. Their son was suffering from a rare thyroid malfunction caused by a gene mutation called Allan Herndon Dudley Syndrome (ADHS). People living with AHDS to experience physical and intellectual disabilities. Thank you for coming! Thanks to the President, the father of David, who presented your story and also this initiative that brought you here in Rome in the sign of hope. I am always happy to meet associations for research and solidarity on rare diseases. Of course, there is the pain of suffering and hardships, but it always strikes me - I remain admired - the desire of families to get together to face this reality and do something to improve it. You, Giorgio and Rosita, together with Davide, your son, have felt within you the urge to do something for him and for people suffering from a very rare disease, and for their families. The name you gave the association: "A Rare Life", says a lot, because it expresses the reality of David, but also yours with him, in a positive, not negative. The negative is, we know, it is everyday reality. But this name says that you know how to look at the positive: that every human life is unique, and that if the disease is rare or very rare, it is still life that is so. This positive look is a typical "miracle" of love. It is love that does this: it knows how to see good even in a negative situation, it knows how to keep the little flame in the middle of a dark night. And love does another miracle: it helps to remain open to others, able to share, to be in solidarity even when suffering from a sickness or a heavy condition, wearing out in everyday life. I believe that from this same attitude, of which I thank God, the 700-kilometer race was born, started ten days ago from your home and arrived today in Rome. A race for life and hope. I congratulate all those who gave life to this "Race of the Rare Words" and with all those who collaborated. Thank you again. I will pray for you and your association. And you too, please, pray for me. Thank you.